Centesimus Annus Pro Pontifice (CAPP-USA) Joins Conference in Vatican and meets Pope Francis and Bartholomew 1, Patriarch of Eastern Orthodox Church. 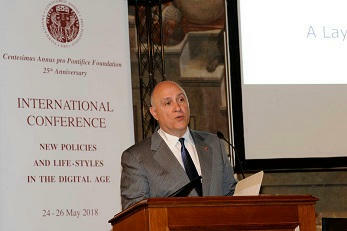 Thirty CAPP-USA members and guests, joined by The Most Reverend Frank Caggiano, Bishop of the Diocese of Bridgeport, attended the Centesimus Annus Pro Pontifice Foundation’s 25th Anniversary Conference, “New Policies and Life-Styles in the Digital Age,” in Rome and at the Vatican on May 24-26, 2018. 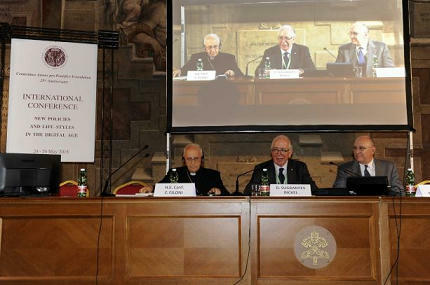 Manifesting the “Pro Pontifice” of CAPP’s name, Pope Francis’ address marked the 25th consecutive meeting and talk with the group by the Holy Fathers. Especially poignant was His Holiness’ personally greeting each one of the 500 people in attendance (see conference videos). The conference was also highlighted with two addresses on, “A Common Christian Agenda for the Common Good” by Cardinal Pietro Parolin, Secretary of State, Holy See, and His All Holiness Bartholomew I, Archbishop of Constantinople and Ecumenical Patriarch - Eastern Orthodox Church. Reflecting on these talks, Pope Francis observed, “Indeed this is an activity where ecumenical cooperation is of special importance and the presence of Patriarch Bartholomew of Constantinople at your Conference is an eloquent sign of this common responsibility”. Another highlight was Bishop Caggiano joining Cardinal Domenico Calcagno, President of the Administration of the Patrimony of the Apostolic See, in celebrating Mass at the Altar of the Chair of St. Peter in Saint Peter’s Basilica. Following Mass, participants processed to the tomb of Saint John Paul II for special prayers.